Each week, Violinist.com brings you links to reviews of professional violin performances from around the world. Montreal Gazette: "I have rarely heard a lovelier or less affected virtuosity…You won’t hear Bruch performed like this very often, the melody handed off from one partner to another like two people petting one cat. 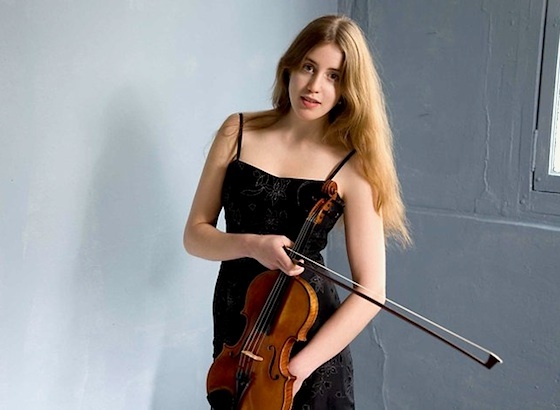 The New York Times: "The violinist Arabella Steinbacher appeared with the orchestra for the first time with a warm, sweetly lyrical account of Mendelssohn’s Violin Concerto." St. Louis Post-Dispatch: "(Anthony Marwood) brought what’s known as HIP — historically informed performance — style to Powell Symphony Hall, with zippy tempos and lean textures that make the music-making feel more urgent." Cincinnati Enquirer: "The piece was instantly appealing. The first movement opened with a long, sinuous melody for the violin in a duet with a cymbal. It evolved into a palette that was bright and busy, with bubbling winds set against glowing orchestral textures. Berman crouched as she tackled its soaring, angular themes with a seamless, lyrical tone." The Oregonian : "The soloist was the terrific young German-Italian Augustin Hadelich, who coursed through even the spikiest passages with ease and sometimes impish spirit, keenly attuned to the splashes of color erupting in the orchestra behind him." The Grand Rapids Press: "Goulding gave a wholly original reading – a bit of flash with her arpeggios, a little sentimentality with her slides and trills, but with extraordinary intonation and expression." Did you attend a concert this week? Please tell us about it, in the comments! Here's another review, from ClevelandClassical.com of violinist Andrew Sords in recital with pianist Eriko Izumida in Chagrin Falls, Ohio, last Sunday. "A masterful grasp of the gypsy spirit, rife with radiant tone, fiery character and an exciting display of bravado with exotic violin effects distinguished the performance of Bartók’s six short Romanian Folk Dances." I went to see Caroline Goulding with the Grand Rapids Symphony...it was fantastic! The way she used slides was very artful, and she made a familiar piece sound very fresh. The concert opener was the overture to Russlan and Ludmilla, which was also wonderful. They played Elgar 2 after intermission, which I wasn't as much of a fan of. An hour of rather unexceptional Elgarian style, but maybe I just need to hear it more. David Lockington, the conductor, seemed to love the piece, but we talked with one of the violists after the concert, and she said she never wanted to play it again. My only disappointment was no encore from Goulding...I imagine her Bach would be amazing.